The website's still reverberating from the Kenobi novel news (the most-read post on the blog ever, in just a little over a week) — but the publishing schedule continues. And my third comic book of the month is much different from the others: Bart Simpson #76 from Bongo Comics! As mentioned some time ago, my first Simpsons story was in #27 of that title, nearly eight years ago. I had intended to do more, but got busy in a galaxy far, far away. And while I'm still working in that realm, I'm pleased to have some more Simpsons stories coming up. John Delaney, Andrew Pepoy, and I have the lead story in #76, which also includes pieces by Eric Shanower, Peter Kuper, and Evan Dorkin. As with most of my Simpsons stories, there's a real-life inspiration to "Fund-Razing." I was in an interminable fund-raising assembly in high school where a speaker was ticking off all the lame prizes that could be won for sales — and one of the guys in the audience yelled out "Ten thousand dollars in cash!" at the appropriate time, causing the assembly to collapse into laughter. 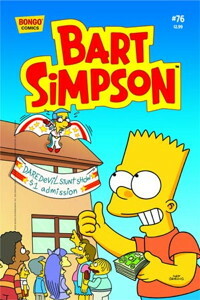 That kid was likely punished — but his efforts go rewarded years later, as Bart pulls the same stunt with chaotic results! Another story coming next month in Bart Simpson #77. Look for it!